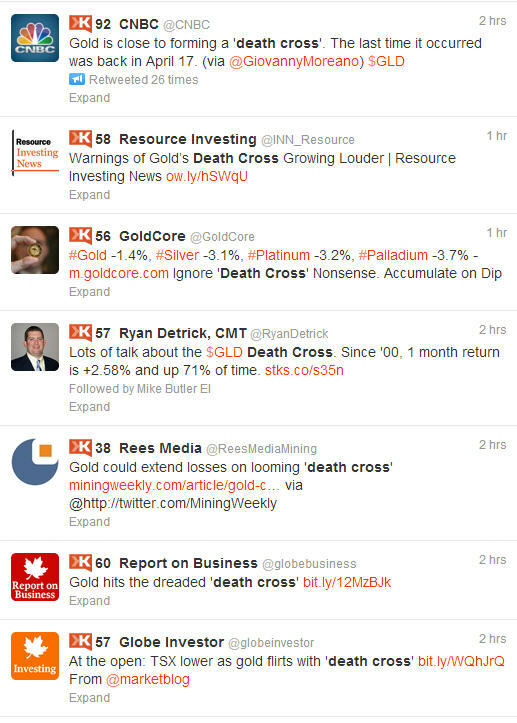 The 'death cross' is everyone's favourite headline right now after gold crashed below $1,600. Spot gold is currently at US$1,582/oz, having lost 1.41% over the last 24 hours. The 'death cross' sounds great, but it is also a technical measure: it's when an asset's 50-day moving average moves below its 200-day moving average. Notice in the chart of the SPDR Gold Trust ETF (NYSEARCA:GLD). The green line, which is the 50-day moving average, is crashing into the red line, the 200-day moving average. In sum the short-term support level is moving below the long-term support level, a Rubicon that gold is crossing which will make it difficult to regain momentum.